From his many Criss Cross dates as a leader to his extraordinary sideman work with Chris Potter, the late Michael Brecker and many more, Adam Rogers continues to blaze a path as one of jazz's most compelling guitarists. 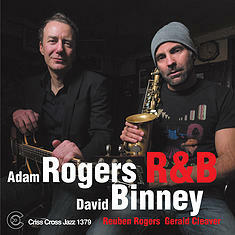 His longtime associate David Binney, alto saxophone great and an influential composer and producer, has also distinguished himself with numerous innovative sessions for Criss Cross and others. On R & B, Rogers and Binney unite to co-lead a lean and hard-swinging quartet with bassist Reuben Rogers (no relation) and drummer Gerald Cleaver. In a departure from their usual focus on original material, Rogers and Binney aim straight for bebop, ballads and classics by Thelonious Monk, Freddie Hubbard and Wayne Shorter, among others. The feel is rock-solid, the improvisations bracing. It's a fresh, unexpected take on the jazz tradition, viewed through a modern prism.